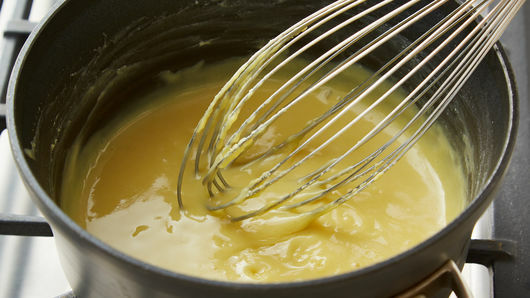 In 1-quart saucepan, mix condensed milk, egg yolks and lime juice with whisk. Cook over medium heat 4 to 6 minutes, stirring constantly, until bubbling. Remove from heat; transfer to small bowl, and refrigerate 1 hour. In large bowl, break up cookie dough. Add flour; stir with spoon or use hands until well blended. Shape dough into 32 (1 1/4-inch) balls, and roll in crushed graham crackers. Place 2 inches apart on cookie sheets. 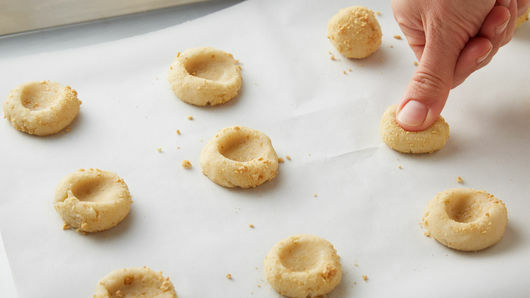 Press thumb into center of each cookie to make indentation, but do not press all the way to the cookie sheet. Bake 8 to 11 minutes or until edges are light golden brown. Immediately remake indentation (1-inch wide) in center of each cookie with back of measuring teaspoon. Cool 1 minute; remove from cookie sheets to cooling racks. Cool completely, about 20 minutes. Spoon about 1 teaspoon lime filling into each indentation. In small microwavable bowl, microwave baking chips uncovered on High 20 to 40 seconds or until chips can be stirred smooth. Transfer to small resealable food-storage plastic bag, and cut small corner off one end. 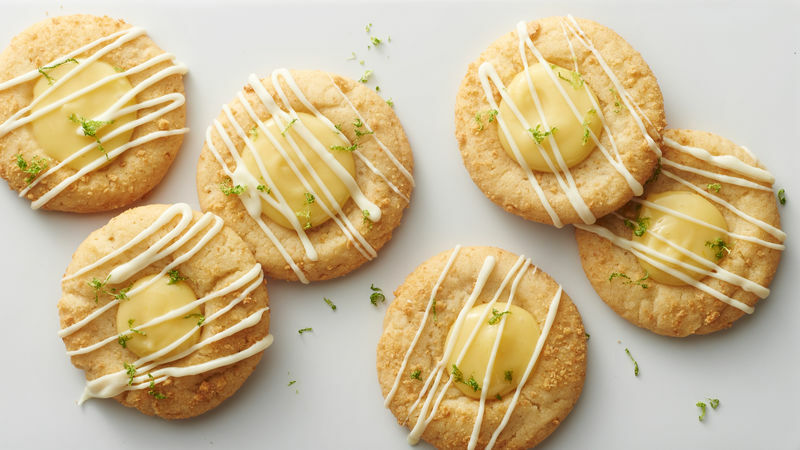 Drizzle on top of cooled cookies; garnish with lime zest, and let stand 10 to 15 minutes or until drizzle is set. Store in refrigerator. 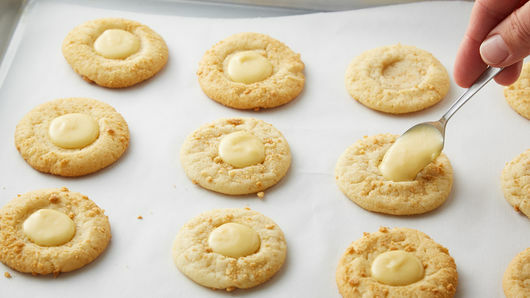 Use a cookie scoop to portion equal-size cookies. 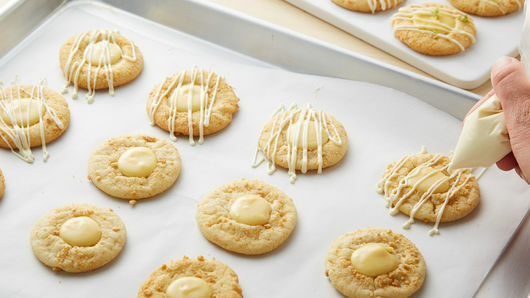 Make the Key lime filling a day ahead of time, and keep refrigerated until you're ready to top the cookies. The filling will set up more when it's cold, making it easier to add to centers. Key limes are small in size and tend to be more aromatic and tart than regular limes. However, you can use regular limes in this recipe. Store cookies covered in refrigerator.